Plagued by nightmares of the conversion process, Julie takes some time off from the resistance to return to her abandoned New Mexico home town…but is targeted for assassination by Diana. Julie has another nightmare about her time in Diana's conversion chamber. She awakens to Donovan's concerned face in a mine shaft where the resistance is hiding. Julie arrives in her old home town of Echo Valley, New Mexico, needing some time away from L.A. and the resistance and the pressures of leadership. The town has been empty since shortly after the Visitors first appeared a couple years ago, the population having disappeared. She does not realize she is being followed into town. On the mothership, Diana reveals to Lydia that she has dispatched one of her best assassins to kill Julie, whom they've learned is heading to Echo Valley. Julie walks through the empty streets of Echo Valley and raids some canned goods from the local grocery store. Then she stops by her old school and hits a few baseballs on the diamond to burn off her nervous energy. She then heads to her old family home and fixes dinner and sleeps in her old bed. Unknown to her, her pursuer continues to watch and spends the night in the barn. Early in the morning, Julie is awoken by the sound of clanging coming from the barn. She grabs her rifle and goes to investigate. She finds an old schoolmate named Judd forging a spearhead in a firepot. Each makes vague accusations against the other about possibly being a Visitor in disguise. But they finally seemingly begin to trust each other and spend a pleasant few days together in the solitude. While walking out in the nearby woods, the two are suddenly attacked by a skyfighter. The house being too far away for shelter, Judd takes her to a cave that used to serve as the local boys' clubhouse. Due to the recent recurring nightmares of her time in the conversion chamber, the darkness of the cave terrifies Julie and she curls up in a fetal position and eventually falls asleep, while the skyfighter continues to rain laser blasts against the hillside where the cave is located. She thinks she hears Judd talking to her as she drifts off. He seems to mention Diana's name and finally says he can't let anything happen to Julie. Later, on the mothership, Lydia reports that Diana's agent was found shot to death by a human rifle near a small grove in the town. When Julie awakens later, the Visitor skyfighter has gone and so has Judd. She finds dried blood outside the cave but from the dried color, can't tell if it's human or Visitor. Twice this issue, Julie recites poetry by Alfred Lord Tennyson. This is a carryover from page 288 of the V novelization, where we learn that Julie loves poetry and one of the things she does to keep her mind off the torture of the conversion chamber is recite poetry in her mind, particularly lines from "The Splendour Falls" by Alfred Lord Tennyson. A nice tie-in between two different V media. This issue ends with Julie again reciting the same lines from "The Splendour Falls". 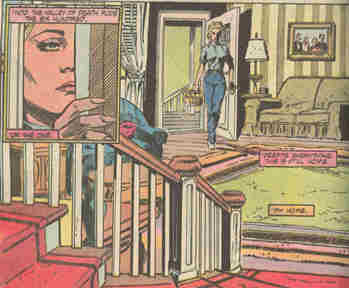 Page 3 implies that Julie's mother left the family when Julie was 7 years old. Pages 3-4 reveal that Julie is from the small New Mexico town of Echo Valley. This is a fictional town. Page 4 mentions that Harrison, Julie's Arizona contact, fought with Lord Mountbatten's special forces in Burma during WWII. Admiral Lord Louis Mountbatten was the commander of the Allied South East Asia Command (SEAC). The signs in the windows of the closed-down shops of Echo Valley on page 6 show the year 1982, indicating when they were closed, which roughly coincides with Julie's statement on page 3 that everyone disappeared from the town shortly after the Visitors first arrived on Earth (although the original mini-series first aired in 1983). As Julie feels nervous and tense walking through the empty streets of Echo Valley on page 6, she muses, "I can feel the fight-or-flight routine is building up in my body. Catecholamines are released into my bloodstream. My heart beats faster, respiration increases, blood pressure rises. Vasodilation occurs as a result, and so I feel a flush on my cheeks." Thanks to her medical training she is able to analyze her own involuntary reactions. Catecholamines are hormones released by the body during stress. Vasodilation is a widening of the blood vessels to reduce blood pressure within the body as a whole or to specific organs. Also on page 6, Julie muses on having spent eight years in medical school. This is the only source I've found that suggests she spent 8 years rather than 4. (The article "Fight or Die" in the British V Annual 1986, states that Julie spent five years studying anatomy before the Visitors arrived). On page 7, Julie strolls by her old school, thinking, Good times there...a long time ago in a galaxy far, far away. She is reminded of Star Wars because Robin once told her that she played John Williams' Star Wars theme in her high school band for John and Diana when they first arrived at the Richmond chemical plant (as seen in "Arrival"). On page 11, Julie recites a line from Tennyson's "The Charge of the Light Brigade", "Into the valley of Death rode the six hundred". Page 11 shows that Julie's old family home is still intact, complete with furnishings. The portrait above the couch shows four people. Is it her family? If so, it implies that Julie has a sibling we've not heard about. After making her way to her old house, Julie sleeps for the night, in what is presumably her bedroom as a youth, on page 13. 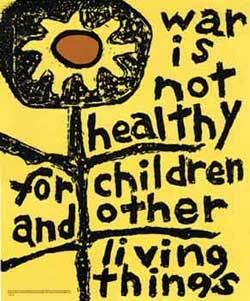 There is a poster on the bedroom wall that says "WAR IS NOT HEALTHY". 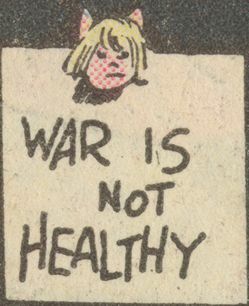 This is a representation (perhaps one the young Julie made herself) of Lorraine Schneider's anti-Vietnam War art piece of 1966. This may touch on Julie's childhood fears of nuclear war, as revealed in the novelization of the two V mini-series (see "Test Subjects"). On page 16 Julie calls the intruder in the barn Judd Andrews. On page 17 she calls him Judd Anderson! So, which is it? On page 17, Judd comments that Julie is able to sneak up on people like a V.C. He must be a Vietnam veteran; V.C. refers to the Viet Cong, the communist army of North Vietnam during the Vietnam War. Also on page 17, Julie and Judd make veiled accusations to each other of being Visitors in disguise, Judd saying, "Maybe you're the one who speaks with forked tongue," referring to the reptilian aliens' lizard tongues. The V-Mail of issue #8 reveals that the cover of this issue was done by Jerry Bingham.